Boiled first then baked... infused with delicious herbs. Here is the perfect side for any meat meal you have. Boil as many potatoes for your family for around 25 minutes in salted water. Drain. Place potatoes in an oven proof baking dish. 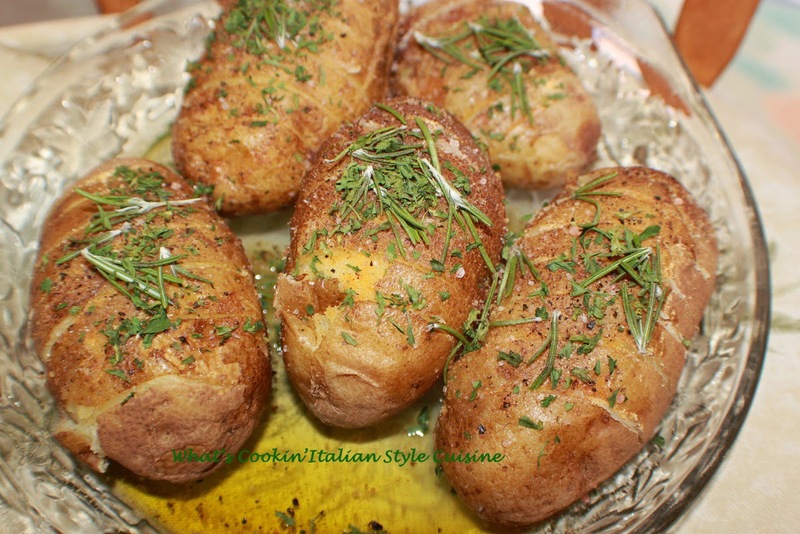 Drizzle butter, olive oil, garlic, salt, pepper and a little white wine over each potato. Bake at 400 degrees until skins begin to crisp and basted each one with the mixture. Around 5 minutes before serving add all the herbs to the tops of each potato spooning the butter from the dish over the tops and herbs, continue baking 5 more more minutes. Serve hot. Simple and very delicious and satisfying!